Please note that Equifax ID Patrol has been discontinued and is no longer available. You can read our old review of Equifax ID Patrol below, or check out the rest of the Identity Theft Protection Services we've reviewed. 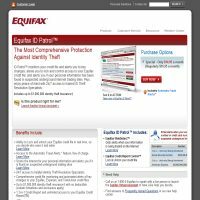 Equifax ID Patrol is a great, US-based Identity Theft Protection service brought to the market by Equifax, one of America's leading credit bureaus. Equifax serves literally hundreds of millions of customers every year in the US, drawing in more than $1.5 billion each year. Considered the oldest of the three major credit agencies in the US (alongside Experian and Trans-Union), it is also the largest, holding information about 400 million users around the world. ID Patrol is Equifax's own-brand Identity Theft Protection Service, and at $14.95, we found it a little pricey, even though it did bring a fair few features to the table. Equifax ID Patrol has a range of useful features that will certainly provide peace of mind to anyone who is concerned about identity theft or fraud. Equifax ID Patrol combines a range of technologies to provide one of the most comprehensive services on the market. The key function of Equifax ID Patrol is the 'Lock/Unlock' function, which allows users to apply a 'credit lock' to their credit accounts, thus closing off access to their information except in specific circumstances. The idea is that users allow access either to specific companies only, or for a specific period of time, so that only legitimate applications for credit or transactions are allowed access to the credit account. Without access, no provider could provide credit services, and thus, identity theft is prevented. Equifax ID Patrol also performs extensive scanning of the Internet (both public websites and data trading sites on the black market) and of various public records to search for protected data belonging to Equifax ID Patrol users. This scanning function is intended to highlight data that may be traded online, and close down access to such information by passing details on to the relevant authorities and preventing access to the relevant credit account. In addition to these measures, Equifax ID Patrol also allows all users access to 24/7 Identity Theft Resolution Specialists, who are specially trained to help users recover from the negative effects of identity theft and associated fraud. Users also have access to a range of support materials, a toll-free helpline and an online virtual assistant to help should any problems arise. While Equifax ID Patrol is certainly reinforced by the its massive parent company, and comes with an outstanding pedigree, it doesn't really do anything that other, cheaper solutions already provide. If you're already an Equifax user, then perhaps this solution is ideal for you as it will integrate with your existing credit account with little difficulty. Otherwise, we would certainly suggest that our users shop around to find a service that offers additional useful features, perhaps even for a smaller monthly subscription. At No.1 reviews, we have reviewed a number of great sites, including LifeLock, one of the market leaders in this industry, and our highest rated site. If you would like to compare what Equifax ID Patrol has to offer with that of another site, we suggest you also check out LifeLock.com. Please note that Equifax ID Patrol has now been discontinued.